Modern society puts a great deal of value on white teeth, which are perceived to give the appearance of health. In addition to cleanings at the dentist, a great deal of time and money is spent attempting to whiten teeth at home. This effort is undertaken with special toothpastes, whitening strips and even the old-fashioned technique of brushing teeth with baking soda. Another strategy, described here, is to use hydrogen peroxide, a substance that is easily and cheaply available at drugstores and pharmacy departments. Brush your teeth normally, with regular toothpaste. Rinse thoroughly with water. Set the toothpaste and toothbrush aside. Pour a small quantity of peroxide, less than 1/4 cup, into a fresh rinsing glass. Swish it around the entire mouth for approximately 1 minute, being careful not to swallow any of the peroxide (gargling is safe, as long as no liquid enters your throat). Spit it into the sink and rinse it down the drain (peroxide left anywhere, including on porcelain, immediately begins a bleaching and cleaning process that can be heard in the form of a hissing of small bubbles frothing up). As an alternative or in addition to rinsing and spitting, dip a clean cotton swab into the peroxide and rub it along the tooth surfaces. This technique cannot get into the spaces between teeth, but it can be useful to increase the whitening of visible surfaces. Rinse thoroughly with plain water, taking as long as a minute again to completely rinse the peroxide out of your mouth. Spit it into the sink and, again, rinse the sink with water. If bubbles are felt fizzing between or around the teeth, rinse again until the peroxide is completely removed. Repeat daily (results are typically seen in 2 weeks or less). After an acceptable degree of whitening has been achieved, discontinue daily peroxide use in favor of weekly sessions. Be careful not to splash any peroxide onto clothes, towels or dark painted surfaces, since the peroxide can bleach the color out of these in spots. Use of peroxide can cause some tooth sensitivity or irritation of your gums. According to the American Dental Association (ADA), it is safe to use peroxide to whiten teeth. You may feel some burning in your gums while swishing with peroxide, but this is not harmful. 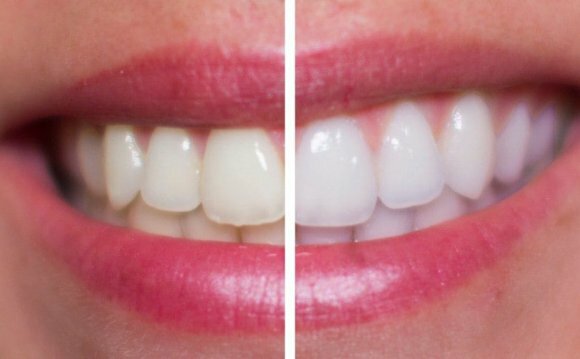 The ADA recommends consulting with a dentist before beginning a home tooth-whitening program, especially for people with dark stains on their teeth, crowns or many fillings.